The funeral for the seven Egyptians who were found shot dead in Libya took place on Wednesday in the main Coptic Orthodox cathedral in Cairo's Abbasiya district. 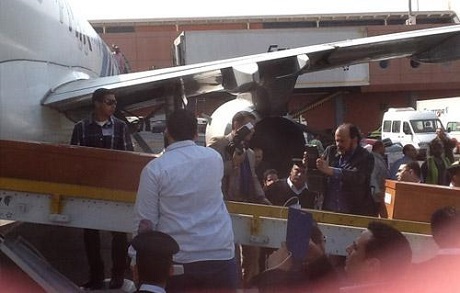 The bodies of the seven men arrived in Cairo earlier on Wednesday. Egypt's army chief Abdel-Fattah El-Sisi has arranged a military plane to fly the bodies to their hometown of Sohag for burial. Meanwhile, newly appointed Prime Minister Ibrahim Mehleb visited Egypt's Coptic Orthodox Pope Tawadros II at the cathedral to extend his condolences, and condemn the violent incident. In a speech at the funeral, Tawadros II thanked El-Sisi for the military plane sent to transport the bodies, as well as the presidency and the Egyptian government for their sincere feelings. He also asked the attendees to pray for the well being and safety of Egypt. "We demand the arrest of the terrorist elements behind this painful attack ... We pray that God will protect the Egyptian people from brutal terrorism." On Monday, the seven Egyptian Coptic Christians were found shot dead on a beach outside of Benghazi, Libya after they were abducted from their apartments the previous day, security officials and local residents said. The incident is the second execution-style killing this year for the troubled eastern corner of Libya. No group has claimed responsibility so far for the murders. The Coptic Church has already demanded an investigation into the killings.